Mentorship Across Boundaries Eman Nadoom, this year’s undergraduate commencement speaker, talks about her time at Kogod and how her professors helped her find her path. Kogod professors aren't just teachers, according to Eman Nadoom, BSBA '17. They're mentors. Nadoom credits her professors with strengthening her academically and encouraging her to follow her dreams. They're what defined her experience at Kogod, she says. "I would visit Professor Linowes every day for advice. I'd ask open-ended questions about my career and interests, and he was always happy to talk," Nadoom says. "Kogod's professors have no problem going out of their way to help you." Linowes was more than happy to provide guidance. He admits mentoring Nadoom was just as enjoyable for him as it was for her. "Eman was always alert and enthusiastic in class and during my office hours, thirsting for new knowledge and eager to test her thinking. She was a pleasure to work with," he says. The mentorship she received certainly paid off. 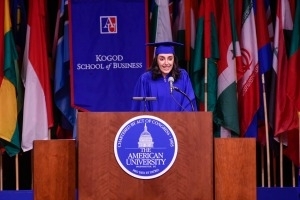 This May, Nadoom crossed the stage at AU's Bender Arena not only as a Kogod graduate, but as a vital contributor to the ceremony. Nadoom was this year's undergraduate commencement speaker, giving her the opportunity to share her Kogod experiences with faculty, peers and family. Nadoom, originally from Kuwait, presented on a theme central to her experience at AU: diversity. "I'm Muslim. I'm female. English is my second language. I'm a minority," she says. "I wanted to talk about something that's relevant-to my life, and the student body as a whole." She spoke about how, in a way, everyone at American University is an immigrant. Each student is from a different place-no one is originally from AU. Receiving one's degree, though, changes that. "We're all from here now," Nadoom says. "Graduating from AU connects us all." She hopes her words remind classmates that they're all different, but all the same. And being different isn't a bad thing; rather, it's a point of growth. "It's how we learn from one another," Nadoom says. Nadoom's experience in the classroom, in addition to her experience as an international student, inspired her to write the speech. Her classes were full of students from around the world, exposing her to different cultures, languages and ways of thinking. One course assignment in particular stands out. Nadoom recalls working on a project with Colombian, Sudanese, Chinese, and American students. They had to combine their different perspectives, all shaped through different cultures, into a single, cohesive product for their professor. It was challenging, but enriching-an exercise in real-life international business. "This is what's so special about AU. In every class, you interact with people from all over the world," Nadoom says. She also valued the school's emphasis on experiential learning. Her courses emphasized hands-on projects that applied theory to practice, giving her a taste of what working in the professional world is like. Her Capstone course with Professor Linowes was her favorite. The class centered on "leadership talks" that required each student to act as a leader in a difficult situation. Each day, students were assigned a different scenario, such as calming a frightened group of people or motivating employees, and asked to role-play in front of the class. After the scene, the "leaders" were critiqued, then asked to act the scene again to fix their mistakes. "You weren't just learning what you were supposed to do. You were learning how to implement it," she says. "It also taught you how to accept criticism." Nadoom believes what she learned at Kogod prepared her for success after graduation. She says her professors taught her to be "a vital contributor, wherever you work," and to "think outside of the box." Her courses' hands-on nature required her to think on her toes, and be "creative in one's ideas." "Kogod really taught me to think," she says. Now a Kogod alumna, Nadoom plans to go to law school, in hopes of one day serving in Kuwait's parliament. She's on a mission to affect change-to use the skills she's gained at Kogod to make a difference. No matter where her path takes her, Nadoom will always feel grateful to her Kogod professors for their mentorship and support. They challenged her to be her best self-whether working on a group project with other international students, or charting out her individual career path. "There's so much to be done in this world, and Kogod helped me see this," Nadoom says. "I hope I can go far."